← Meet Ken and his new fuzzy friend! JayLee was diagnosed with Leukemia on April 21, 2011, just one month shy of her 5th birthday. After going through several different avenues to try and figure out what was causing her many urinary tract infections, swollen lymph nodes, easy bruising and the severe pain in her joints, doctors suggested she receive a bone marrow biopsy to make sure it wasn’t Leukemia. JayLee was admitted to Blank’s Children’s Hospital and began treatment the following morning. Shortly after, she received her very own Chemo Duck to accompany her throughout her cancer journey. 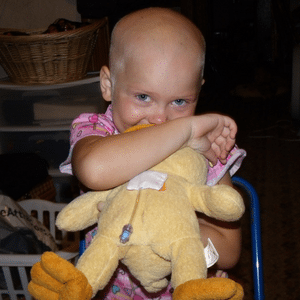 Throughout the entire process, JayLee loved that Chemo Duck could go through all the procedures with her and most of the time before her so she could see what it would be like. JayLee recently celebrated the fact that she is five years off treatment! She took her last chemo pills on June 24, 2013. And even though she is in the clear, her friendship with Chemo Duck continues to be as strong as ever. While JayLee loves to snuggle with her Chemo Duck, she also enjoys staying active and can oftentimes be found playing basketball, swimming or playing with crafts. “There will be good days and bad days (honestly more bad than good), but enjoy every moment you have. Treatment can be rough but there is a light at the end of the tunnel. I found that the biggest help we found was with friends and family. I wanted to do it all on my own even though so many people offered to help. Even though it is your child, it takes a strong support system to help you get through it all. Thank you, Danyel and JayLee, for sharing your story. 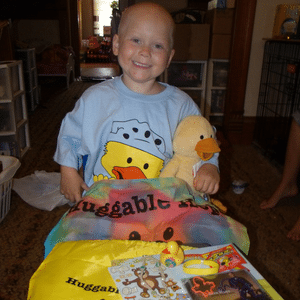 We are so happy to hear that Chemo Duck is now a permanent fixture in your family! This entry was posted in Newsletter, Stories. Bookmark the permalink.